Canada will have to wait another year before getting a shot at a gold medal. 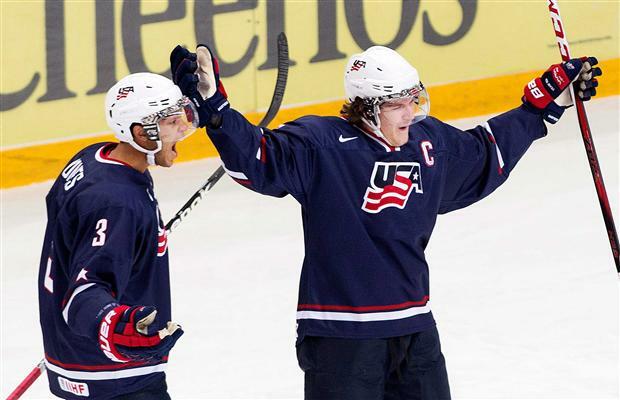 The USA defeated Canada 5-1 in the IIHF World Junior Hockey Championship semi-finals on Thursday, overwhelming a supposed dream team squad from the opening whistle to the closing horn. The US will face Sweden in the gold medal game and Canada will take on Russia in the bronze medal game. Jake McCabe scored the first two goals for the US, both of which eluded Malcolm Subban, the first as he attempted to look through an army's worth of players blocking his view. But even though neither first period goal was Subban's fault, he didn't look right from the beginning, and neither did his teammates, who came out flat and let the US dictate the tone of the game. In fact, Canada was lucky to escape the first period only down by a pair, but could not take advantage of the break, starting the next two periods exactly the same. Even with a stacked roster, Canada never looked dangerous for large stretches of the game, and when they did manage to break through and get a quality chance, John Gibson slammed the door. Ryan Strome alone was stopped on at least three excellent scoring chances. Even Ryan Nugent-Hopkins looked pedestrian, never showing the dominant edge that an experienced NHLer should display against an inferior group. As the deficit mounted, Canada failed to play with any urgency, apart from a two-minute power play with less than 10 minutes to play in the third period. Head coach Steve Spott attempted to juggle his lines all game to find some sort of combination that would produce a spark, but none did. Neither did pulling Subban after the fourth goal. The trademark Canadian physicality was decidedly absent as well, giving the team an aura of indifference about the outcome. Perhaps playing in Russia, away from the delirious Canadian fans who jump out of their seats at each hit, sapped Canada of some energy and belligerence, but coming off a bye to the semi-finals, and playing against a team who played the day before (and six times in eight days) makes this an unconvincing excuse. Eventually, as the horn mercifully sounded, it was clear the better team won. Overall, the effort was poor, especially for a team aided by a lockout and described as a dream team similar to the gold medal winners in 1995 and 2005. In fact, the 2013 Canadian team was composed in much the same way as the 2005 team, one of the greatest ever. Both teams benefitted from a legitimate NHL player—Patrice Bergeron in 2005 and Nugent-Hopkins in 2013—had the consensus first overall pick in the upcoming entry draft—Sidney Crosby in 2005 and Nathan MacKinnon in 2013 (although MacKinnon is not nearly the lock that Crosby was)—and had a ton of first-round picks on the roster. The differences were minor: The 2005 squad was more of a 19-year-old team, with only two players younger (Crosby and 18-year-old Cam Barker), whereas the 2013 team had a two 18-year-old defencemen (Morgan Rielly and Griffin Reinhart) and two draft-eligible, 17-year-old forwards (MacKinnon and Jonathan Drouin). The comparisons were obviously premature, the product of hype, as the 2013 group can at best win bronze, something that would be an unthinkable outcome for the 2005 team considering what the roster ended up doing in the NHL. Now, not only will Canada be playing for a bronze medal, already a disappointing outcome for a dream team, but they will be playing to avoid the worst finish by a Canadian team since 1998. All the big name Canadian forwards were duds. Where was RNH, Huberdeau, Schiefele, and Strome? Didn't feel like anything was going to happen anytime they were on the ice, and aren't they supposed to be the team stars?